Clear paint can style tins make adorable party or wedding favors! Perfect for wrapped candy, suckers or bagged bath products. Each pail has a tin handle and a recessed tin lid, and clear PET plastic sides. These tins measure 3" diameter and 4" tall. These pails are not recommended for direct use with foods, liquids or high temperatures. Also not recommended for use with substances that could cause the metal to rust. Choose from solid or clear! 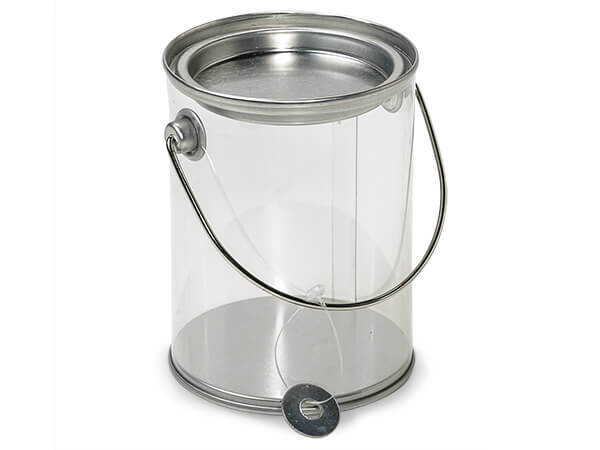 Clear Pails have tin coated steel lids, bases, handles with clear sides. Solid Pails are made of metal tins. Both pails have an attached round opender on handle to open lid easily. TheTins have tin bases with clear or tin coated steel lids. Make great displays and packaging for gourmet foods and packaged candy. We recommend a food safe barrier such as clear cello. Made in China.